Coyote had been hunting for several days, but could not catch anything. Mikasi aka abai anba a’nanzhi, thanzhi idadan u’thanba’zhi. His stomach was empty and he was very hungry. Ni’xa u’gthan thinge, ki nanpehi te atashan. When he was walking, he could hear a flock of turkeys in the distance. A’dan manthin athai tidi, zizika-ma duuba wa’nanan te. They were eating in the green grass. Ganki, zi’zika-ma pezhe chu tha’tai. Coyote thought, “at last, I might catch something to eat”. Mikasi aka, “e’thegan, zizika-ma u’bthan kanbtha”. Coyote got as low to the ground as he could to sneak up on the turkeys. Mikasi aka bi’spa’spa zizika-ma wagthajai. He did his best to blend in with the brown dirt. Mikasi aka, i’kinanxthe ganthai, tande shaabe ekigan u’danbe ganthai. As hungry as he was, he knew he had to use his trickery not to scare them away. Nanpanhi the atashan bthin, zizika-ma wi’u’waxa kanbtha. Looking at the turkeys, he thought to himself, “I know what I’ll do”. Zizika-ma wa’danbai, “ki wathingthan ga’xai”. Without wasting anytime, he ran back to his den as fast as he could. When he got to his den, he grabbed his drum, drumstick and a sack. A’ki bi’gan, ku’ge, ku’gewetin, u’zhiha shti thizai. Upon returning to the turkeys, they were still eating. Zizika ta, aki bigan, shetannan wa’tha’te-man. He could see turkeys of all sizes. Zizika ananska a’zhithanthan wadanbai te. Wathingthan thishtan te e’gan ga’xe ganthai. Coyote went a little ways from the flock and started singing. Mikasi aka e’shan a’hi bi’gan, wa’an ti thethai. Instead of being frightened by the Coyote, the turkeys were curious as to why Coyote was singing. Zizika-ma, mikasi thin nanpa-bazhi, e’an wa’an te, ibahan ganthai. The turkeys watched and listened to him sing, but were very careful. Zizika-ma danbe a’hi, ki a’nanan, shan sabe. Some of them flew away, but most stayed. Duuba gi’an athai, a’higi a’tha’bazhi. The turkeys that stayed, decided they liked his singing and started walking toward him very slow and carefully. Zizika athazhima, wa’an ke xta-thai, ki e’ta thi-shan manthin. Meanwhile, Coyote sang with his eyes closed but opened them very slowly to see if the turkeys were still there. Ganki, mikasi aka i’shta thi’pizhe wa’an, zizika-ma shetanna e’di-ibahan gantha. The curious turkeys couldn’t stand it any longer. They had to know why Coyote was singing. Mikasi e’atan wa’an te ibahan ganthai. “Brother, why are you singing?” they asked. “Zhinthin-ho, e’atan wa’an ni’a?” Abiama. 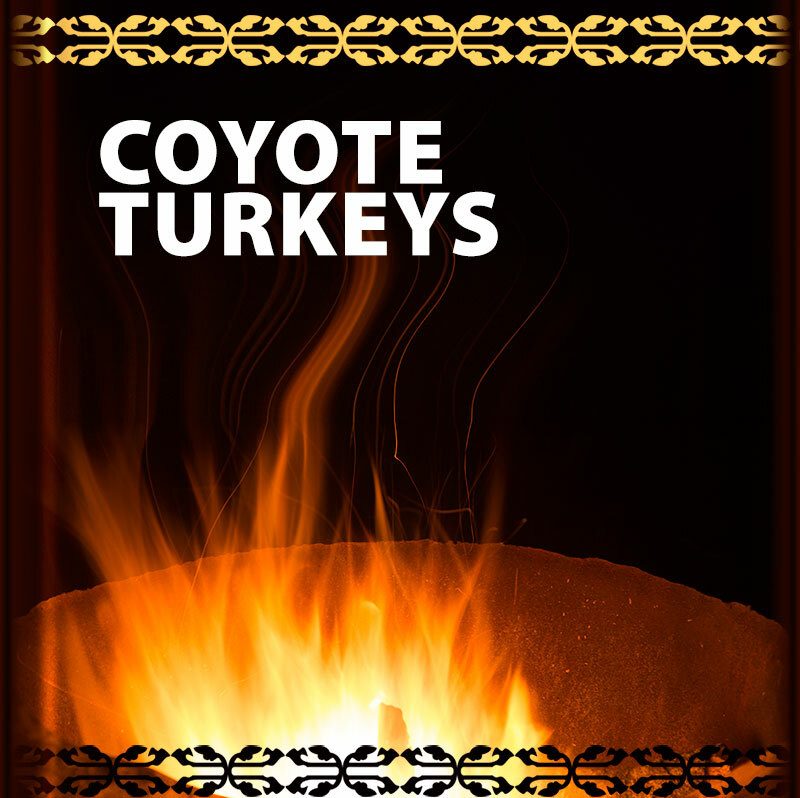 “I am singing because of you beautiful turkeys”, Coyote said. “Wa’an a’gthinte, zizika manshe u’janni”, mikasi aka abiama. “Manshan gi u’jan a’ni, e’wan a’wa’an”, abiama mikasi aka. The Coyote, being very tricky, had told them a lie. Mikasi aka, i’usi’shtan u’thai te. The turkeys, not being very smart, but proud of their feathers began to spread their wings and tails. Zizika-ma, manshangi shpahai te, e’ganxti, inbe, a’hin e’thanban thibthai biama. “You should dance to show off your feathers, I’ll sing for you,” Coyote said. “Wathachiga’xe ki manshan gi gipahai ga, a’wa’an tamike”, mikasi aka-abiama. Mikasi aka, “wi’kai”, “manshan u’jan angathin”. Coyote smiled, his plan was working better than he had hoped. Mikasi aka i’xai, wa’thigthan e’ta te wa’thitan. “A’wa’an ki zizika shi-ma”, abiama mikasi aka, “anthanbi’ske wachiga’xe tama”, e’di u’thatan wachiga’xe ta’ma, ki bthanze-ma a’shiata buta u’thishan wachiga’xe tama”. The turkeys all agreed and were anxious to dance! Zizika-ma bthuga i’nanhi, wachiga’xe ganthai. Coyote started singing again; he sang one and started on the next song. Mikasi aka shi wa’an, e’thashtan ki, shi wi anan. “This song is special”, said coyote, “everyone must have their eyes closed”. “If you open your eyes, your eyes will turn red”. “The wa’anke u’zhu”, abiama mikasi aka, “wangithe ishta thipinzhe, wachiga’xai ga.” “Ish’ta’gi ni’btha ki, ishta’gi thi xhid’de ta’nike”. The turkeys didn’t question the Coyote, so they closed their eyes real tight and they began to dance spreading their tail feathers. Zizika-ma, mikasi i’manxe ba’zhi, i’shta thipinzhe wachiga’xe ta’ma zizika-ma wachiga’xe inbegi thi’xadanbe. Coyote saw that the turkeys had their eyes closed tight, continued to sing. Mikasi aka zizika-ma ishta thipinzhe wadanbe, ki-shi wa’an. While he continued to sing, he brought out his sack and grabbed the biggest and fattest turkeys closest to him and stuffed them into the sack! 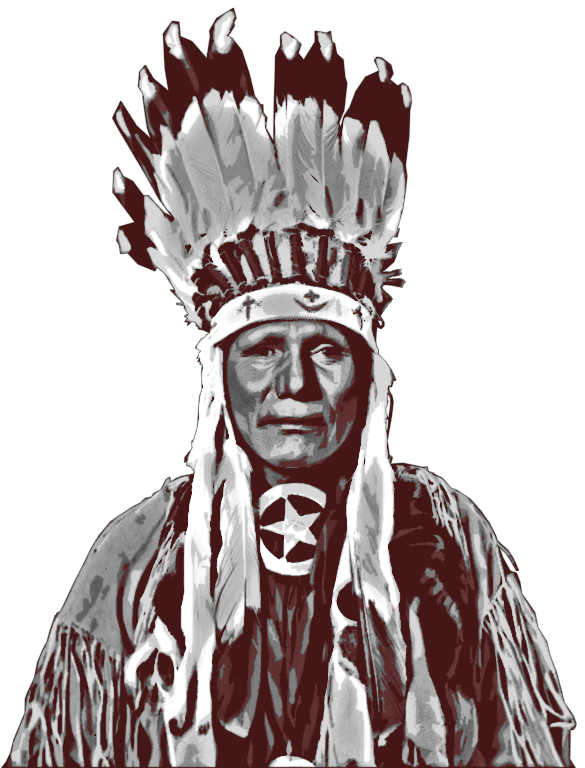 Gan wa’an ka’shi ki u’zhi gthiza’bi, zizika shi, u’than bi’dan ganki wi than-than e’ta, u’biski. Meanwhile, Coyote sang louder so the turkeys being put in the sack, would not be heard by the others. Mikasi aka wa’an ke tha’hegabazhi, zizika-ma xtha’zhe wa’nanan bazhi tai. On the outer circle, one skinny turkey heard a strange sound but wasn’t sure what to do. A’shia’ta bu-ta zizika bthanze wi, u’thazai a’zhi nanan, i’da’dan ga’xe shti nanthin. He was told not to open his eyes, should he open them or not? I’shta thibthazhi’ga u’withai, a’wategan ga’xe’a? Once again he heard that strange sound. He wanted to keep dancing, but he kept hearing that strange sound. Wachiga’xe ganthai thanzhan shi nanan. Finally, the skinny turkey, opened his eyes just a little bit. Ganki, zizika bthanze aka i’shta thi’zhinga, mikasi danbabe. It was then that he saw Coyote still singing, but grabbing his big fat brothers’ and stuffing them into the sack. Hu-thahega, “Zhinthuha tanthinga!”, “wa’thate ta’ka,” abiama. Hearing their skinny turkey brother, some of the turkeys flew away and lived. Zizika bthanze thinnanan, u’shte-ma gian athai. The Coyote’s plan worked and he wasn’t hungry for awhile. Mikasi aka wathigthan e’ta wathitan, nanpehi te thinge. From that day on, the turkeys had red eyes. Anba shetan, zizika-ma ishta zhide athin.